I think your left index is a small ulnar loop. ... 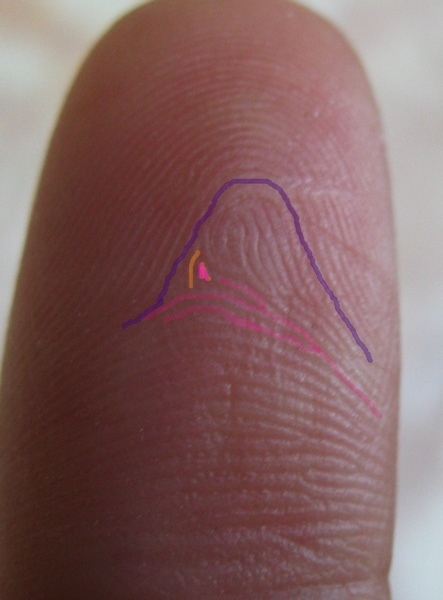 Regarding your left index finger, yes there are some irregular ridge lines inside but these do not make any well defined pattern, nor a triradius, etc. - though I do see 5 ending ridge lines in a row in the upper center of the loop. So, therefore we can simply continue to speak about an ULNAR LOOP. this print of mine has been pronounced a loop by Martijn a while ago, but it's still rattling around in my head as not quite sure. So I finally sat back down with the FBI handbook and took a good print to get to the bottom of this, but I'm STILL not sure. Argh. Patti, if you could chip in your opinion, that would be awesome! Did I find the type lines (green), delta (red), and looping ridges (blue) correctly? And what do you think about the light blue line? It looks like an appendage on the main (dark blue) loop to me, in which case the recurve would be spoilt. Or would you keep going from the light blue to the dark blue ridge and see that as the main recurve, rather than an appendage? I think the print is attempting to be a whorl based on it's core, which would have likely been the initial formation of the ridge pattern. It is definitely spoiled as a whorl. The print presents a slightly different perspective of the details than the earlier photo. It still appears that there's a ridge count of at least one for it to qualify as a loop. I'll take a closer look tomorrow. My thought at the moment is that the first dark blue line in front of the delta is ridge count 1, then the bulging rod at the center is the core. We lose the 2nd ridge count because of the appendage. It has a delta, a core and a ridge count of 1 which makes it a loop. Patti's posts makes sense to me. I'd also say it is a loop. I noticed that you tried to draw the FBI's type lines... but these should always be just two lines - not the larger number of lines that you have drawn in your left picture. So maybe your confusion (partly) results from not finding the correct type lines? PS. Regarding your confusion, be aware: in the FBI system the 'type lines' are not decisive for whether a pattern is a loop (or whorl). Although the newer print does clearly show that there is a triradius, I noticed in your description here, Martijn, that you have suggested a lack of a triradius results in a loop, but if there were not triradius, in this case, it would have been a tented arch. Thanks heaps for your patience clearing up my questions! 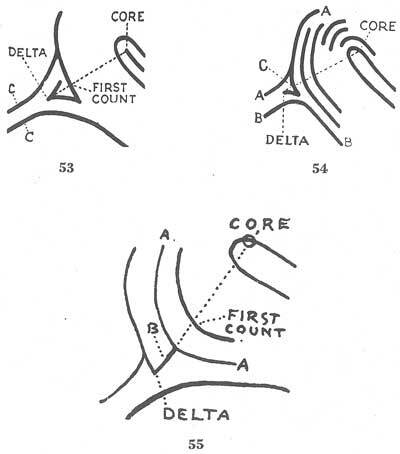 I think second time around I'm finally getting it ... What confused me most was the way that the only proper looping ridge was spoilt by the appendage: without the presence of an unspoilt loop, I didn't even think of counting the short ridge in front of the delta. That's where I went wrong! And yep, I did get a bit carried away with the type lines, thanks for the reminder that there should be just two of them. It took a little thinking through because the one ridge in front of the delta attaches to the type line. It can also be seen as a radiant representing the loop or pattern field of ridges. 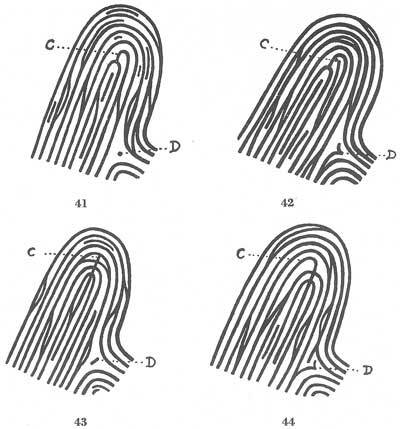 What convinced me was example 53 in the FBI's book that showed the same ridge line as the first count. Then it would seem since you only need one ridge count between the core and delta it qualifies as a loop. No, in that passage I considered the possibility of the presence of a second triradius at the center of the pattern area. 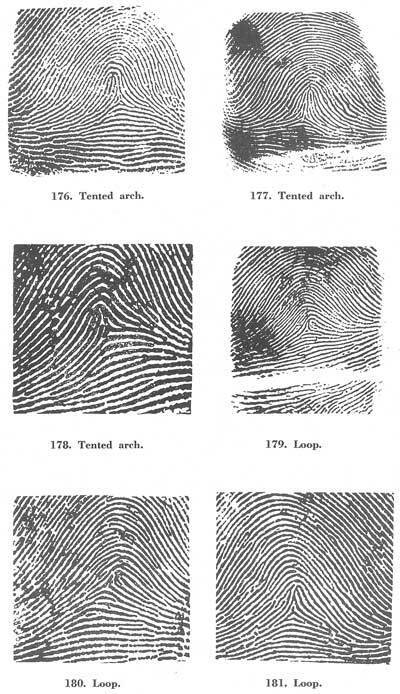 And because there is no such second triradius... the fingerprint can not be a whorl, and therefore resulting in a loop. Okay, great to know that you are aware of how the FBI has described the 'type lines'. I've been looking for a sample with just a rod and one recurve that involves the type lines and this first 'ridge count' ridge that is out in front of the delta. I guess the core is not on the rod because the rod is below the shoulders, on the samples with rods. Maybe the top of the rod can't be the core because the shoulders can't be placed on the spoiled loop...? Take a look at 179 and 180. The only recurve is spoiled in 180 and they call it a loop. Awesome, you got it Patti! Example 180 was what I overlooked. Makes sense now, thank you! kiwihands wrote: Awesome, you got it Patti! But... I think 180 is a tented arch because the only recurve is spoiled by an appendage. Haha, ok... so even the FBI book can get it wrong.